"North Korea has an incredible, brilliant economic future if they make a deal, but they don't have any economic future if they have nuclear weapons," Donald Trump said at a Conservative Political Action Conference. 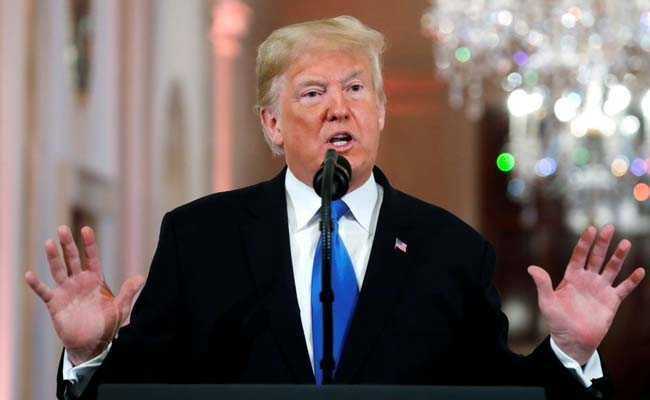 US President Donald Trump said on Saturday that North Korea does not have any economic future with nuclear weapons as the Pentagon confirmed the United States and South Korea had agreed to end joint large scale spring military exercises. "North Korea has an incredible, brilliant economic future if they make a deal, but they don't have any economic future if they have nuclear weapons," Trump said at a Conservative Political Action Conference. He added that the relationship with North Korea seemed to be "very, very strong." According to a statement, acting Pentagon Chief Patrick Shanahan spoke with his South Korea counterpart on Saturday and they agreed to adapt their training programs. The two "made clear that the Alliance decision to adapt our training program reflected our desire to reduce tension and support our diplomatic efforts to achieve complete denuclearization of the Korean Peninsula in a final, fully verified manner," the Pentagon said. South Korea's military issued a similar statement also confirming plans to end the spring joint military exercises. Special Representative for Korean Peninsula Peace and Security Affairs Lee Do-hoon is planning on visiting the United States in the coming week to meet with U.S. officials to discuss the second U.S.-North Korea summit as well as the future agenda, according to a South Korean official. The Pentagon said the U.S. and South Korea had agreed to "newly designed Command Post exercises and revised field training programs." U.S. officials have long said the scope of the spring exercises, known as Foal Eagle and Key Resolve, would be reduced. Reuters and others reported on Friday that such an announcement would take place. [nL1N20O1CO] To encourage talks, the United States and South Korea have suspended a number of military exercises since the first summit last year between Kim and Trump. Trump on Saturday addressed criticism from the parents of Otto Warmbier, an American student who died after 17 months in a North Korean prison. They had complained when Trump said at a Hanoi news conference that he believed Kim had nothing to do with Warmbier's death. Trump said he was trying to maintain "a delicate balance" to coax the North Koreans into giving up their nuclear program. Some observers credited Trump for refusing to be drawn into a bad deal. Others criticized him for praising Kim's leadership and accepting his assertion that he had been unaware of Warmbier's treatment. Analysts believe North Korea has 20 to 60 nuclear warheads which could threaten the U.S. mainland if fitted to its intercontinental ballistic missiles. The United Nations and the United States ratcheted up sanctions when North Korea conducted nuclear and ballistic missile tests in 2017. Washington has demanded complete, verifiable and irreversible denuclearization before sanctions can be lifted, a position Pyongyang has denounced as "gangster like."